RASPBERRY CAKE makes life a little bit sweeter! This cake is inspired by one of my fave drinks, the Moscow Mule. 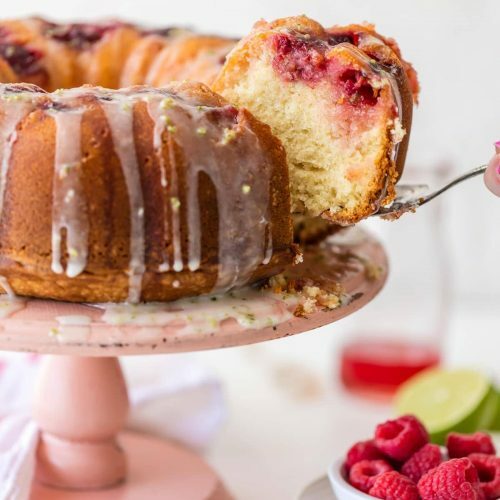 It's made with fresh raspberries, ginger beer, a raspberry moscow mule simple syrup, and a fresh lime glaze. Preheat your oven to 315 degrees F. Lightly flour a 6 cup bundt cake pan or spray with nonstick spray. In the bowl of a stand mixer, use the paddle attachment to combine the sugar and butter. Cream together for 5-7 minutes or until the butter is pale and fluffy. Add in the eggs, one at a time. Mix for about 30 seconds in between one egg. You may need to scrape down the sides in between eggs as well. Add in the vanilla and salt. Reduce the speed to just above low and add the flour in one cup at a time. Once combined (be careful not to over mix), add in the ginger beer slowly so it doesn't splash up. Turn off the mixer and set aside. Add the raspberries to the bottom of the bundt cake pan, spreading them out to cover the bottom. Pour the cake batter over the raspberries and smooth out the top. Bake for 75-80 minutes, or until a toothpick inserted into the center of the cake comes out clean. Heat a small sauce pan over medium high heat. Add in the ginger beer, sugar, and lime juice, stir to combine. Allow the mixture to come to a light boil and then reduce to a simmer. Simmer for 5-7 minutes or until the syrup is slightly reduced. In a medium bowl, stir together the powdered sugar and lime juice. Once combined, stir in the lime zest.